Since the bubble burst in the 90s, plunging Japan into a recession, this elaborate venture has limped along. On the periphery of the resort is an American military base. 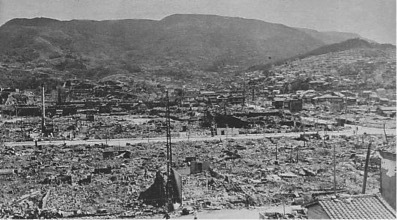 Sasebo was one of the possible targets for the atomic bomb; escaping this fate, it was mostly destroyed by conventional weapons during World War II and shortly after occupied by the Americans in 1945. The unique low-rise Henn-na Hotel, one of the latest ideas for reviving the area, is a short walk from the bus station. It is spacious, airy and minimalist with lots of white and neutral colours; light pours in through the large floor to ceiling windows that look out on a well-kept lawn with fledgling trees. 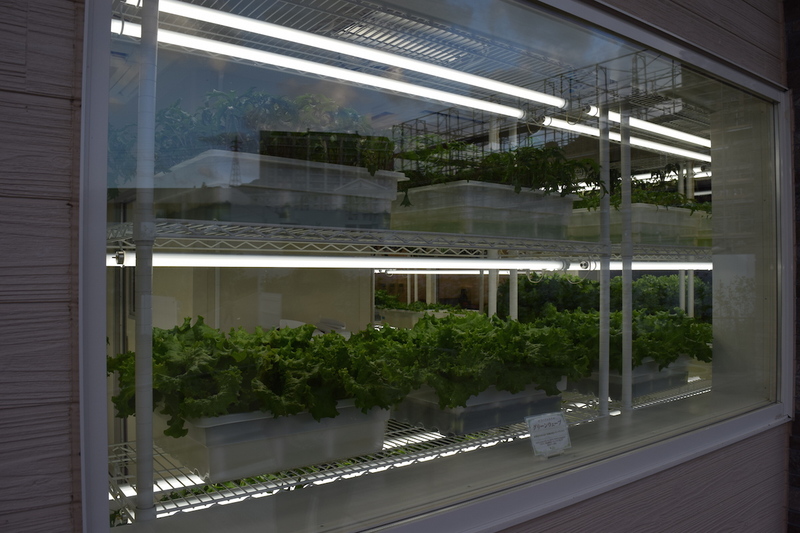 The restaurant, housed in a separate building, is also simple and elegant with a hydroponic garden that supplies the wonderful greens that make up the salad buffet. 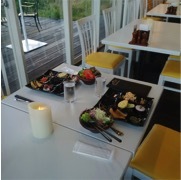 We bypass the food sold in vending machines and opt for the human chefs and the food is excellent. 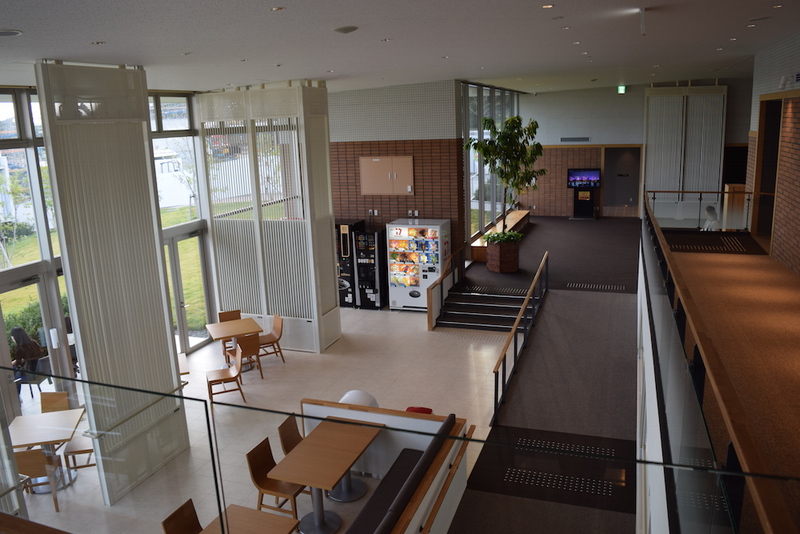 The hotel was designed by Kawazoe Lab, the Institute of Industrial Science, University of Tokyo and Kajima Corporation. The building materials and the seventy-two rooms are designed for environmental health and efficiency: no TVs; motion sensors operate the lights; radiant panels automate the room temperature; toiletries and accessories are kept to a minimum but can be purchased from yet more vending machines; daily room cleanings have been eliminated; and there is the option to have face recognition technology replace the room key cards. The feature of this hotel that has made international headlines and the reason we are spending the night, is the robots—they staff the check in, greet you at the door, and inhabit your room. Billed as “the ultimate in efficiency” and promising to “turn the hotel industry on its head,” the plan is to take this model international. The greeting cartoon-like robot has a big pink head, green arms and yellow legs—and sways from side to side as it delivers its welcoming message in both Japanese and English. The check-in desks are operated by the pint-sized Nao, a female android called Yumeko (“dream girl”) and a dinosaur with a bow-tie and cap (only the dinosaur copes with English). Although they are promoted “as warm and friendly” and guests are invited to converse with them as the robots “go efficiently about their work,” it quickly becomes clear that the robots follow a set script and the process is in fact about getting the guests trained on self-check-in. After I have pressed all the appropriate buttons and asked for a second key, the dinosaur turns one of its big eyes to look at me and a human pops out from behind an office door to ask for my passport and to tell me a second key is not possible. The robots are equipped with cameras and face-recognition software. I imagine being greeted by this “efficient” technology late at night on some strip of generic highway lined with cheap motels and fast-food restaurants in Middle America and ponder how long it would take a human to appear on the scene and fix the system if it shut down as technology is wont to do. Like so much of the automated technology these days–in banks, supermarkets, and the airline industry—this is about customers doing all the labour so that profit can be more “efficiently” concentrated by the vendor. The animated robots serve as a “fun” but expensive gimmick and are completely unnecessary to the bare bones of automation that is at the heart of this industry shift. In the room, Chu-Ri-Chan–a “cute” pink and yellow bot that sits on the night table–starts chatting away unprompted in Japanese, scaring the living daylights out of me. It answers guests’ questions about such things as the time and the weather and responds to requests to turn on and off the lights or to set an alarm; I cannot help think it also acts as the perfect surveillance monitor. I had been enjoying the effortless washroom where both the lights turn on and the toilet flushes automatically, but the night proves fretful as the lights seem to have a mind of their own and I have to get up in the wee hours and read the instruction manual for how to get them to stay off. As one so often does when technology offers up a solution to something that was never a problem, I am cursing at this point and asking what was wrong with the simple light switch. 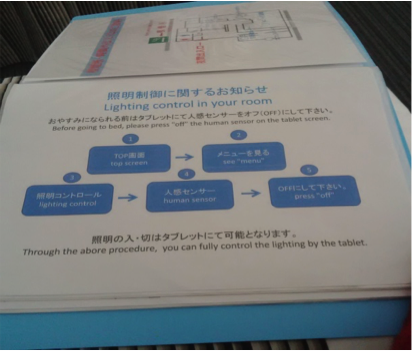 Even when I finally get the lights off…the blinking blue eye on the ceiling (the motion detector), the illuminated screen on the desk and Chu-Ri-Chan make for a restless night—clearly the designers have not read the research literature about keeping screens out of the bedroom. 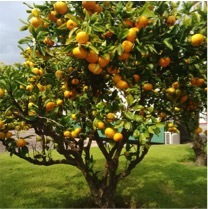 In the morning, I eat more of the delicious greens for breakfast and relish the fresh oranges and pineapple, but the hotel machines seem to be on strike or perhaps they are shut down in the morning as the strictly enforced check-in time is not till three. The door-greeting bot is quiet and still, Nao is missing, and the self-flushing toilet is not working (there is no manual option). The self-checkout lacks the animated robot spectacle that happens on arrival; I was left to operate the machines on my own till I asked the sleepy dinosaur for a receipt and a hotel staff popped out once again. I wonder about what the staff think about monitoring these robots that are replacing their jobs and whether they get irritated with the constant and repetitive bot chatter. 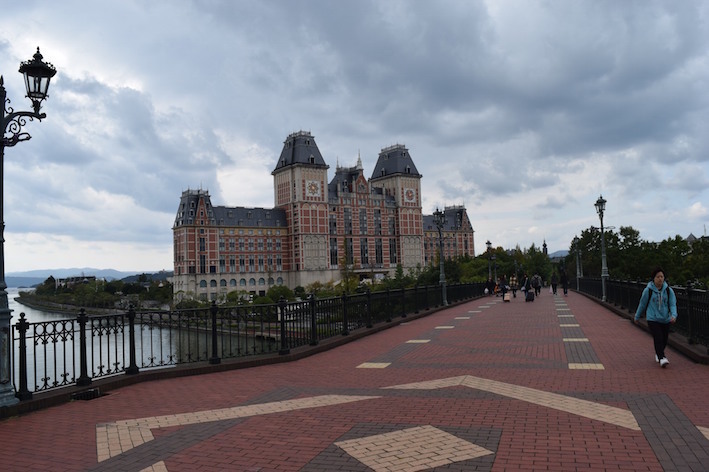 We take the train from Huis Ten Bosch to Nagasaki city to visit the Peace Park, the point of impact of the atomic bomb, and the Atomic Bomb Museum. I am struck by the modesty of the memorials for this apocalyptic event that I learned about in grade school and that in my imagination conjures up images of a burnt-out wasteland full of instantly vaporized people, black rain, screaming burning children, and civilians suffering slow and horrific deaths from radiation poisoning. Steeped in an animistic tradition that respects the spirit in things and nature—the Nagasaki Atomic Bomb Museum, dedicated to peace, puts a great deal of emphasis on destroyed objects and buildings. Yet the fascination with how a metal structure or coin or piece of clothing was affected by the blast seems to cover over the paucity of the names and stories of those who died. In a remarkable demonstration of resilience the city of Nagasaki, like much of post-war Japan, rebuilt itself in the wake of this traumatic event. From the nightmare of the bomb to military defeat to war crimes, a newly demilitarized and democratized Japan embraced the future promise of modernity. Yet this most destructive of weapons–that shut down any optimism about the progress of a civilization that had spent all its concentrated intellectual and creative power on inventing a more efficient way of killing humans—still casts its shadow. I am trying to reconcile the simulated seventeenth-century Dutch village swept clean of any disease or dirt and the cheery robot hotel on its outskirts with the violent history of this prefecture. Since the 70s, Japan has welcomed the mostly gender neutral and ubiquitous kawaii culture that roughly translates as “cute” and uses an aesthetic of bright colours and child-like qualities–it is all about softness, pacifism, vulnerability, harmony, and innocence–an understandable response to the trauma of the War. The animated hotel robots—with their big eyes and high-pitched voices–perfectly accommodate this aesthetic as do many of Japan’s largest companies, which use kawaii to market their products: Asahi Bank uses Miffy on its ATMs and All Nippon Airways has a line of Pokémon Jets. “Cute” covers over the more disturbing aspects of modernity and capitalism (though a 90s backlash to this sugary version has also spawned kimo-kawaii or “gross cute”). Putting a friendly face on robots, the Japanese government is embracing this “revolution” as a response to a rapidly aging and declining population, facing a contracting economy; the promise is these machines will free up humans for more creative work. “Ultra efficient” robots are also being marketed as a better option than “foreign” workers. The memory of mushroom clouds might well explain this assertion of borders and the trust in machines over humans and yet, paradoxically, Huis Ten Bosch also celebrates the historical relations between the “foreigners” from the Netherlands and Japan that began in 1609.The question that needs to be asked is whether this technology threatens to continue the dehumanizing logic of a War ignited by toxic racial theories that dropped the “efficient” A-bomb–the ghosts are still clamoring to be heard in the wake of the catastrophe. Lord have mercy. I don’t want my world cluttered with these highly-pitched, irritating robots. Thanks for the heads-up!